After Gyeongbokgung Palace, we continued on to Bukchon & Samcheongdong. Samcheongdong is a street adjacent to Gyeongbokgung. It is one of the most beautiful streets in Seoul, incorporating a mix of traditional Korean houses with modern cafes, art galleries, designer and specialty shops. To my knowledge, Samcheongdong is also a high-end area with many government officials residing there as it is near to the Blue-House (Cheongwadae). Cheongwadae is the official residence of the President of Korea. Check out the many unique cafes at Samcheongdong. It's a place where the East meets West. You find modernised cafes and shops operating in traditional looking house. Unique as it is, you don't feel that either of these are "out of place", but well-mixed. I really love the nice cafes in Samcheongdong. If I have the luxury of time, I would probably try out all these nice-looking cafes. 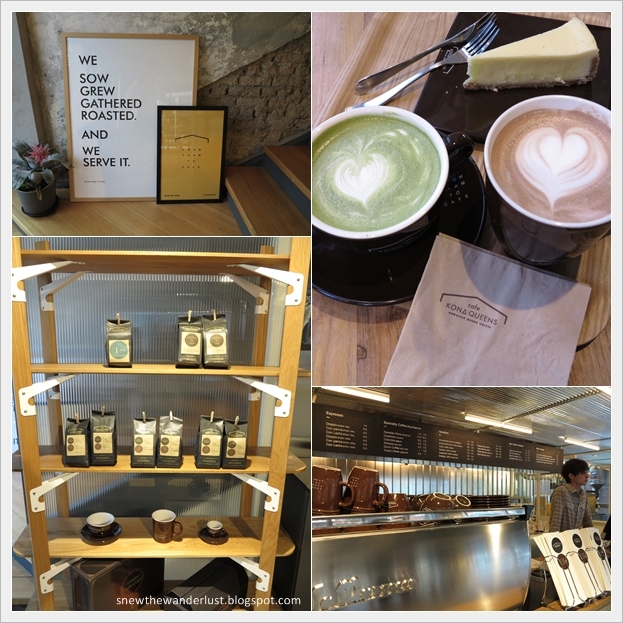 I was told that the must-do at Samcheongdong is to enjoy a cuppa of coffee with waffles. A pity that I did not get to try to waffles. 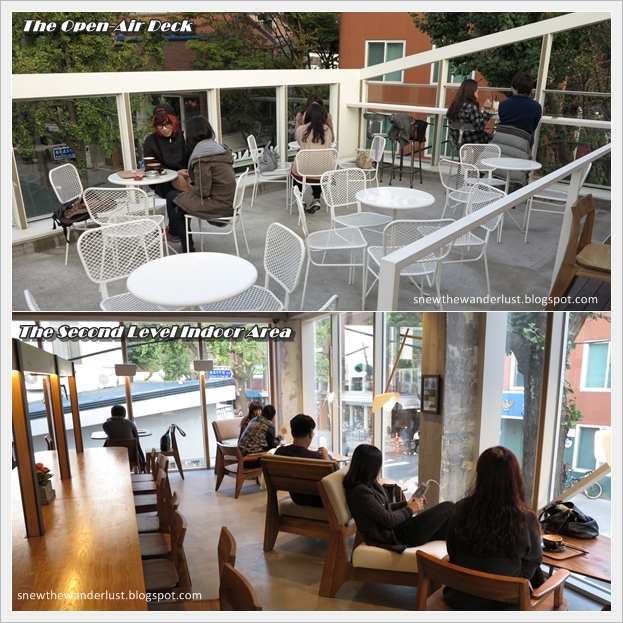 We spotted these nice cafes while we are on the uphill of Bukchon. This would be my dream cafe, if I ever have a chance to open one. It is call Kona Queens. The cafe has a full glass frontage. Guests can choose to sit at the 3rd storey, outdoor area or the second-level indoor dining. As there were people smoking on the outdoor deck, we decided on the second storey which has a better to people-watch. What I was surprise was that the menu are all in English. The staff spoke good conversational English, and most of the customers were young people. I believe the older folks would prefer the traditional Korean Tea places. Free WIFI is commonly found in cafes. Enjoy my favourite Green Tea Latte with a cheesecake. 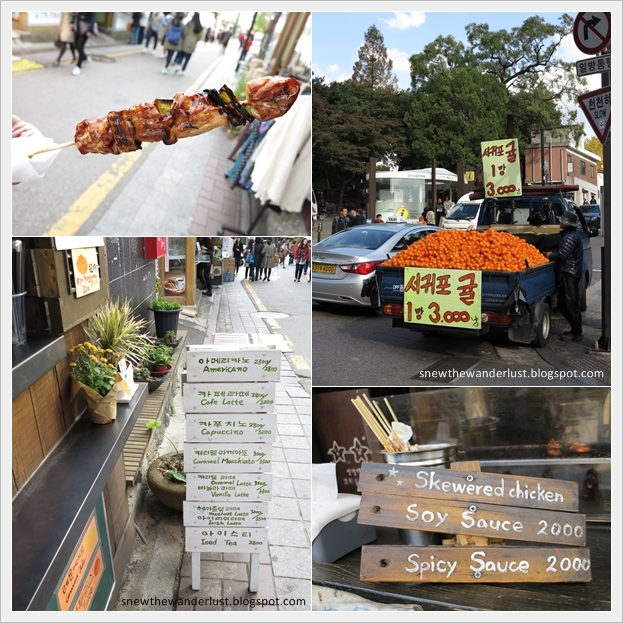 Continuing on in Bukchon, you will find street stalls, restaurants and art galleries. Street Stalls that we came across. We were searching for the Bukchon Hanok Village and finally arrive after walking around the area for about half an hour. The Hanok Village is the Korean traditional houses which dates back to the Joseon Dynasty. Till date, there are still residences in these houses, while others have been converted to guesthouses, culture centres and teahouses. There are 8 views of Bukchon - the photospots of Bukchon. Looking at the roof tops, are you thinking that you have travelled to the past? When we were there, Persimmons are in the season. Can see them growing everywhere. I believe the resident decide to grow it on higher ground so as to prevent people from plucking it. Honestly, the persimmons was pretty tempted to pluck them as well! Anguk Station (Subway Line 3), Exit 2. Go straight for about 300m to arrive at Bukchon Hanok Village. Anguk Station (Subway Line 3), Exit 1, 2, or 3. Walk 10 minutes.